The 1935 limits came into force when Japan refused to be bound by any 'Western' treaty aimed at curbing Japans right to build what it liked. 45,000 tons and 16" guns, were going to be huge ships. Well armed, well armoured with good speed. If the 'Western' countries had been aware just how big the Japanese giants were going to be, then you can imagine the size of the monsters the rest of the world would have had to build in reply. For once the Tyrrhenian Admiralty was ready for the change. It already had the guns on order, the order for armour was ready to go, the design was ready. All the Admiralty required was the money. It had blown the budget with the two Cyprus class and to go back to the Senate with cap in hand asking for multiple millions more for another new ship to 'keep up with the Jones's' was going to be difficult. For once the Senate did not quibble. Building the ship would keep jobs going for thousands of people and employ thousands more manning the ship and keeping it at sea. The Tyrrhenia was to be an all round improvement of the previous Cyprus class. Bigger dimensions. More armour, from 12" belt to 14" belt armour, thicker deck armour, better underwater protection, all the minor bulkheads and end plates were thicker and better laid out. Bigger propulsion unit required to move the ship at 30 knots. Better layout of the deck superstructure and secondary / tertiary guns. The aircraft handling equipment were better situated. It was surprising what an extra 10,000 tons could do. The Tyrrhenia joined the Fleet in December 1940, and was the only undamaged capital ship available. The fleet sortied out of Syracuse harbour on occasion, but never with any intent to put themselves in harms way. The Commonwealth aircraft carriers had the Tyrrhenian Navy spooked. Though the Tyrrhenian Admiralty put a liner conversion into production to an aircraft carrier, it would not be completed till 1944. The Tyrrhenia was in Syracuse harbour with the rest of the fleet when Tyrrhenia surrendered. Ceded to the United Kingdom as part of the reparations package, the Royal Navy trialed the Tyrrhenia against the Vanguard. 1950 and as part of a package to retain Malta and its harbours to British occupation till 1999, the Tyrrhenia was to be returned to Tyrrhenian control. While the Tyrrhenia had been under Royal Navy control, the ship had been brought up to Royal Navy standards. 40mm had replaced the 2 pounders and the 20mm had been deleted entirely. Radar now sprouted from every free piece of deck space. The aircraft handling facilities had been deleted and the hangar split into offices and accommodation. 1955 and the world is looking at missiles to arm its ships with. The American cruisers of the Cleveland and Baltimore types were some of the first converted to prolong their service lives. Looking backwards from our timeline with 20-20 hindsight, we can see the US Iowa class doing 50 years of service and wondering why a lot more countries did not do the same with their capital ships. Looking at the Tyrrhenian Navy's point of view, they had been lucky to do a deal for the return of the Tyrrhenia, then they had to do all they could to get the most service life out of the Tyrrhenia, 50 years or more. The best way is to convert the aft end of the Tyrrhenia to carry missiles. There were three options willing to help out Tyrrhenia with the conversion work, United States, United Kingdom, and Russia. All would like the chance to have Tyrrhenia as part of their global hegemony because of its strategic position in the Mediterranean. Because of its past history in sourcing armaments from the United States, that country was the front runner, and also because of the conversion work that was to be carried out on the Italian cruisers. Tyrrhenia and Italy had been both allies and foes in the past, but in the post World War 2 era it was best for them both to be friends. Sharing armament sources would mean they could place bulk orders jointly for a more favourable price. Both navies needed that sort of advantage as neither country had money to spare. At the end of the missile conversion, the ship had a mixture of gun armaments. It retained the two forward twin 16" controlled by the Mk.38 director, all of the 5.1" were removed and replaced with four twin automatic 3"/70 mountings controlled by the MRS 3 director, lastly for the gun armament was the five twin 40mm twin Mk.V mountings left over from its time in British hands fitted with Mk.57 directors. The 40mm remained as they were good at shredding small boats and zodiacs. Many small craft were encountered during the exodus from North Africa as the militant Islamic governments took over the North African countries and Islamic law was put into force. Tyrrhenia was very close to North Africa in places and became the first stop for the 'Mediterranean boat people'. Tyrrhenia could not afford to have these people settle in Tyrrhenia, there were no jobs for them, no housing, no services (water/sanitation), the refugees just became squatter camps as the Tyrrhenian Government tried to find countries to take them. An insoluble problem. Notes TNS Tyrrhenia (1940) Museum ship from 1990. 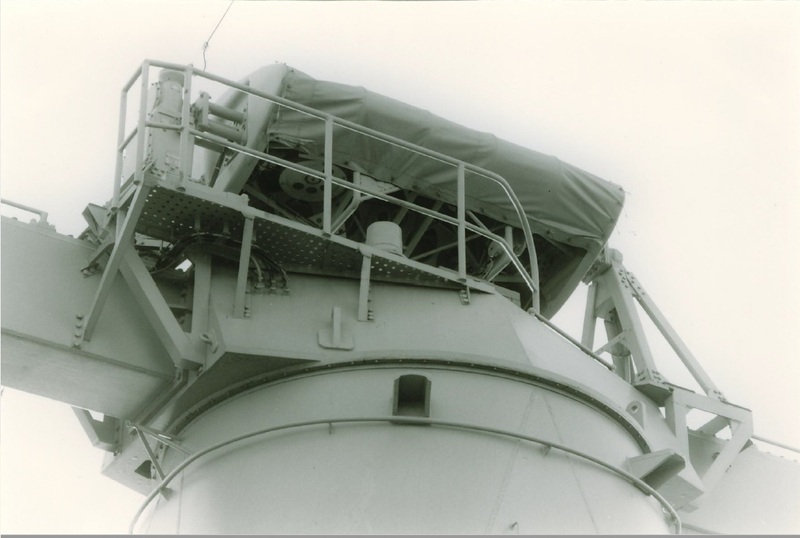 Mk.38 director on board the Tyrrhenia from 1959 to 1990.